Don't Believe the Brewers Are Done? Manny Parra Apparently Does. ~ The Bucky Channel - The World of Sports from Wisconsin's Perspective. 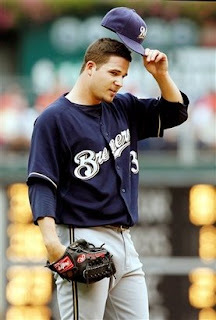 Home » Manny Parra , Milwaukee Brewers , Philadelphia Phillies » Don't Believe the Brewers Are Done? Manny Parra Apparently Does. Don't Believe the Brewers Are Done? Manny Parra Apparently Does. I can't even think of a way to sugarcoat what is happening with this team right now. I know there are many of you that are still staying, "Don't worry, the Brewers are still two games up in the Wild Card. It will be fine." But will it, really? I don't know, as hard as I'm trying, I just can't stay positive about this team right now. They are playing with little inspiration, little guidance, and little direction. It's almost becoming too frustrating to watch. I'm going to try to keep the rest of my emotions bottled up, and just focus on what actually happened Saturday afternoon. Manny Parra absolutely crumbled in the worst way, only lasting 1 1/3 innings, giving up five runs. An absolutely terrible performance. After Parra was pulled, the Brewers actually outscored the Phillies 3-2, but by then the damage was done. Philly walked away with the 7-3 victory, and pulled to within 2 games of the Crew in the Wild Card race. A pretty awful game all things considered, and they'll get back together on Sunday for a day/night doubleheader. But don't worry baseball fans, you may still be able to see playoff caliber teams play at Miller Park this month, if the Cubs and Astros decide to play their series in Milwaukee (which, by the way, I would steer so far clear from). TBC's Player of the Game: I don't know. Jason Kendall? Brewers are done... They are not ready for big time. No, man! They will turn it around. Have some patience... Go Brewers! Never say die, never surrender. I have come this far with this team and I'm not giving up yet. Maybe I'm crazy but I think this team has one more hot streak left in them.